There has been a lot of discussion in the UFO community lately about disclosure. There has been so much, in fact, that many people don't want to hear the word anymore. The word disclosure has become almost as unpopular as the word UFO. The disclosure word became unpopular, perhaps because there have been many predictions of imminent disclosure with nothing happening. People now either believe that it won't happen, or they share the position taken by John Alexander and repeated by former Senior CIA officer Jim Semivan, which is that "disclosure has already happened, it is confirmation that we are after." What needs to be clarified is that there are two types of disclosure. Most researchers, when they refer to UFO disclosure, mean the President stands at the podium and says "ETs are here." That would be full disclosure. Disclosure is defined as "the action of making new or secret information known or a fact, especially a secret, that is made known." Government UFO disclosure is someone who has a need-to-know revealing information about the UFO mystery that we didn't know before they started talking. An example of this might be Hillary Clinton saying "They (aliens) may already be here." This is a big departure from government officials who have maintained that none of the UFO evidence shows any indication of an ET presence. Disclosure is also officials admitting there is probably life out there in outer space. Saying they may already be here is to me a disclosure. Saying aliens may be here is a big deal, especially when the same Hillary Clinton and her campaign manager John Podesta state that if elected they will disclose what they can about the government's secret UFO knowledge. When George W. Bush is asked if he reviewed the government UFO files when he got to the White House says, "maybe," that is disclosure. He could have said "No" but he didn't. He is revealing something we didn't know as the official government position is that there are no unreleased UFO files. Seconds later, Bush responds as to whether he can talk about what he saw, and that too is disclosure. Plan 1: A Government Cover-up - The government plan might be to cover-up and bury the UFO story. If that were the case, their actions would be to simply shut up about the subject and never talk about it again. Canada, as an example, released all their UFO sighting files in 1967, announced they would no longer investigate UFOs, and then completely shut up. Unlike the United States, in Canada, there have been no whistleblowers, government rumors about underground bases, or leaked documents. Government UFO researchers in Canada have nothing to research or research. The lack of any discussion on the part of the Canadian government makes it look like they might, in fact, not be involved anymore. If there is a cover-up, it is a cover-up of what the Canadians described in a 1950 Top Secret memo to be the "most highly classified subject in the United States." The release of that information is punishable by ten years in jail for every item leaked. The amount of "seemingly" leaked material that I will point out in this book strongly indicates that there is no full cover-up going on. There have been no UFO prosecutions, and it is very evident that officials are aware of the UFO leaks, and where they originate. Plan 2: The Disclosure Plan - The second idea is that the United States government is preparing for full disclosure. This theory is flawed from the start because they would not be leaking bits and pieces of unsupported stories into the public domain. If the plan were to disclose, the president would just stand in front of the White House press corps and announce whatever the truth is behind the UFO mystery. If the government wanted full disclosure, they would take the editor of the The New York Times and The Washington Post to an underground base and show them a downed saucer and alien bodies. Then they would provide whatever statements, photos, and documents required to do a front-page article with the truth. What has been going on for 70 years does not fit this scenario. Plan 3: An Acclimatization Plan - The third possibility is that they are preparing the population over an extended period for the knowledge that we are not alone in the universe. Other such as Bob Bigalow have termed this confirmation. When the evidence gets a fair review, it seems apparent that there is some long-term acclimatization plan going on. The burning question is what government is doing to reveal the UFO story to the public, why it is being done the way that it is, and what was the final plan. The United States government has not shut up and remained quiet as in Plan 1. They have not made a disclosure announcement as in Plan 2, so they are obviously doing something in between. Seen in this light, the statements of Hillary Clinton and George Bush now make sense. They are playing a gradual disclosure game. Don't lie, but don't reveal classified information. It is a difficult road they have to walk. If Clinton was doing full disclosure she would say ETs are here and I will produce the documents. If she were covering up, she would not have brought up the subject. She did something in between. If Bush was doing full disclosure, he would have brought documents and alien pictures to Jimmy Kimmel's interview. If he were covering up, he would have said he didn't look at the UFO documents instead of saying "maybe." He would have said I don't know anything, instead of "I'm not saying nothin'!" He did something in between. Once the actions of the United States government are seen as gradual disclosure or acclimatization event, the things they have done, and continue to do, start to make sense. 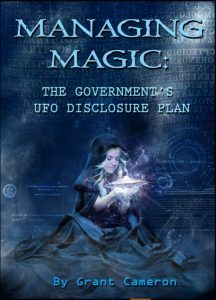 I will shortly release a book called Managing Magic: The United States Government Disclosure Plan, which is a historical look of what the government did, and perhaps why they did it. In the book I tried to look at the 64 possible reasons that prevented the President of the United States from telling the true and complete story, even when some like Ford and Carter were pro-disclosure when took the presidency. I tried to recount 50 odd stories of efforts made to get out the UFO story, while at the same time protecting the classified UFO secrets. Included among these is Tom DeLonge and his ten high level government sources, five of them who have been identified and confirmed to be key government figures. What most people don't know or forget is that some of these officials were dealing with people in the UFO community long before they ever joined DeLonge's team of advisors. I had written about Podesta's UFO interest twenty years ago, and I knew of his CIA advisor Jim Semivan long before he made contact with DeLonge in April 2016. The other thing that becomes evident when all 50 stories are put together is that these acclimatization leaks of UFO information go right back to the beginning when Kenneth Arnold was given 8 x 11 photos of flying saucers by the 4th Air Force along with the assurance that they were legitimate. The stories include the 1975 UFO documentary called "UFOs, Past, Present, and Future" that was made and paid for under contract to the Pentagon at a time when the Pentagon said they were not involved in the UFO topic. This must have gone well because the same producers were contacted in 1985. During the negotiation for that documentary the producers were told that the government wanted another documentary as there was film in the vault that they wanted to get out. Then there was the 1988 documentary called "UFO Cover-up ...Live" that appeared on TV in the final couple of weeks of the Reagan administration. Among the things leaked in that documentary was Area-51, first leaked six months before it became public. The documentary introduced the idea of the live alien, which had never been mentioned, and identified the remote viewing program at the DIA, which remained Top Secret till it was revealed seven years later. From history I gathered together 14 men who I refer to as magicians. They were CIA and their job over the last 70 years was to get the story out via five men that I refer to as the Messiahs. These Messiahs included researchers such as Bill Moore, Steven Greer, and Tom Delonge, who each saw themselves as the person picked to bring disclosure to the American public. 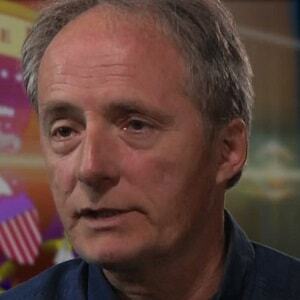 My conclusion is there is no plan to fully disclose, no matter how loud the demands inside the UFO community are. The plan is to continue to drop stories till people are so acclimatized that when full disclosure does happen by those in power, it will surprise no one. When all the evidence is gathered, it is pretty clear what is happening, but like every good story there is one story that refuses to fit in. This story deals with the election of Donald Trump, and his UFO briefing. I have watched this story for months and was actually contacted by people who thought Trump would not be told the truth. Within this Trump world is a story of a briefing, and a president who was picked by intelligence to be /the disclosure president. It involves a portal/pod. It involves a "goodie bag" which is like an instant replay of the 1997 Corso filing cabinet or the 2012 Chase Brandon Roswell box story. The story also claims that the new president is "open to disclosure and against disinformation." The story is full disclosure and is tied into an identifiable member of the CIA.